"Choosa is one of the biggest graphic design contest marketplaces. The idea is really simple; on our website a company can start a contest for any sort of graphic design he needs and our design community will start uploading designs. Crowdsourcing designs as we call it." Vern Burkhardt (VB): You founded Connaxis in 2000 and Choosa in 2009. Would you start by telling us about Connaxis? 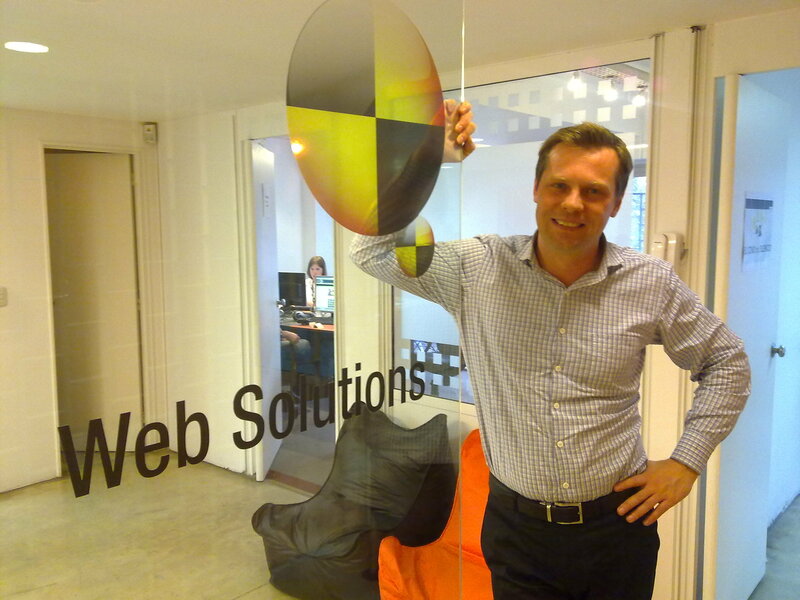 Peter van Grinsven: We consider ourselves to be a digital consulting company that offers full-service solutions. We produce and manage complex web applications. It's a niche we want to be in, and there's a lot of business in this area. Complex web applications are difficult to do, and we can do them well in Argentina. The costs are a bit better here, which allows us to have a large team of a lot of specialists working to support clients who are located around the world even though we have a special focus on South America. VB: "Fully integrated Internet outsourcing service." Is this a good summary of your business? Peter van Grinsven: Yes, it's a full-service company. We could specialize in one thing but we don't want to do it. We want to be generalists. We want to be able to muster the power of all of the specialists working for the company. Our vision of the company is it is like an orchestra which has many different instruments. It's almost impossible for a small to medium sized company to hire 35 people to build a web site or to keep them employed supporting it to meet their e-Commerce needs. So they need a partner that can do this for them. We have in-house people and methodologies to work in an effective way – checks and balances, processes, roles, best practices for web development, effective training for our people. It's pretty much what you would expect with many outsourcing services, but in the digital space it's still relatively new. It's still relatively undiscovered. Being successful online, with e-Commerce, is not an A-B-C solution. It's something that is still being discovered by many companies. VB: Would you tell us about your process for designing web sites and providing on-going support for these sites? Peter van Grinsven: We initially do a lot of analysis such as becoming knowledgeable about our clients' industries. We spend a considerable amount of time talking with our clients because they know his their businesses the best. Our conversation includes the desired return investment of the cost of the website, the targeted number of people who will we come to the web application that we're going to build, the expected number of contact forms to be generated, and how much each new contact is worth to the business. Through this process we help our clients develop a marketing plan for their Internet marketing activities. Based on this analysis and marketing plan we complete a functional and attractive web design for the website, such as wireframes and sitemaps. We think of web design as a form of graphic design that creates visual layouts for objects which will be coded to create websites and other online media. When all the analysis is completed the real production phase starts, where we creatively do the design for the website. After the design is completed, of course, the actual development of the site occurs – functional analysis, technical analysis, layout, and actual development. Our web 2.0 developers work with Open Source platforms for e-commerce solutions like Drupal, CakePHP, and Magento. They use other platforms as well, including HTML and CSS, JQuery, PHP, CMS, and MODx. We believe that by using Open Source technologies in an intelligent way we can empower small and medium sized companies because they need to have the same power in their e-commerce applications without the high cost that larger companies can afford. Once development of the website is done we like to manage and support the website. We can manage it in two ways. We can manage the Internet marketing to make the web site successful using social media or Google adwords for optimization of search engines. Or we can manage the support for the site as providing online chat support, helpdesk support, and email customer support in six languages – English, Spanish, Portuguese, French, German, and Dutch. VB: You went online with Choosa in 2009. What led to your developing this website? Peter van Grinsven: We built the Choosa website partially because we wanted to show prospective clients that our company with all its specialists have great creativity and a deep level of knowledge about functionality and programming. We also wanted to show them we could put such an application into the market, and could leverage the people in our company to provide Internet marketing and support, and then fully manage the website. VB: Would you tell us about this innovative graphic design website? Peter van Grinsven: Choosa had been growing within Connaxis for a while and now it is a separate company. Choosa is a crowdsourcing platform for companies who are looking for a graphic design. Contest Holders, the term we use for companies which seek designs using Choosa's website, may launch a contest for graphic design, print design, web design, or their other design needs. Graphic design competitions may be for a logo, buttons or icons, logo and stationery branding, or T-shirts. Print design may be for a flyer or brochure, print advertisement, or stationery and business cards. Web design may be for a company's landing page, small website, banner ads, or blog or WordPress theme design. Of course companies may launch competitions for other types of designs ranging from brand naming to packaging for products. We launched Choosa because it would be interesting to create a platform focusing upon creative designers from South America. A lot of creative designers work from home and they are looking for international contacts. They're looking for clients in the U.S or Europe for example. We created a level playing field in which they can participate in contests and start creating income streams. Moreover they can showcase themselves, create a portfolio and learn about design opportunities that they would not otherwise become aware of. Our platform can be considered as a stepping stone in their careers on which they can start creating income streams. When designers gain a high profile on our platform they are in essence being pre-qualified by the crowd. The crowd is composed of our clients who are using competitions run on Choosa to select designers to do design work for them. The community of designers also rates the designs that are entered in the competitions. Does this mean that a designer who wins a design competition may end up with an on-going relationship directly with the company who sponsored the competition? Peter van Grinsven: Yes, this is the benefit for creative designers. It's a great tool for lead-generation. Contest Holders search for the right fit with the creative. If a Contest Holder chooses a winning designer it is very probably that the Contest Holder wants to continue working with that creative. Moreover, the creative designers enjoy the competition. VB: Would you give us an example of the contests that have been run on Choosa? Peter van Grinsven: Every single day we have new contests being launched so there are many examples. The contest for "The Art of Wearing High Heels" is a good example of a company looking for a new logo. For US$ 195 they received over 100 design proposals and found the logo they were looking for. In general Contest Holders receive a great variety of high quality designs from which they can choose the winning design. VB: Operating with three languages must add to the challenge of running the Choosa website. Peter van Grinsven: Yes, it's a great challenge. It has to be translated into three languages – but this is exactly what makes us special. There are hardly any other competitors providing this service. In this way we facilitate the introduction of crowdsourcing for graphic designs into South America. VB: Do you find that Contest Holders often have difficulty describing exactly what they are looking for in the way of design? Peter van Grinsven: Most Contest Holders, and these are not just small business owners, don't know exactly what to cover when describing a design they require. They will merely think, for example 'I need a new logo'. Similarly, freelance designers often don't know what questions to ask the business owner about the specifications for a design. One of the benefits of the Choosa platform is that it provides a structure for these two parties to communicate about the design requirements. The creative briefs which entail the information about what a Contest Holder is looking for are structured in such a way that the right questions gets asked. Questions entail a description of the business, the target audience, specific requirements, and materials to be used. These creative briefs are very easy for any Contest Holder to fill in. In addition, our support people look over the creative briefs before they are posted on the website because what we want to make sure they are clear and complete, thereby enhancing the likelihood that the contests will be successful. We implemented a personalized mentoring system in our website in order to increase the likelihood contests will be successful. The description in the creative briefs and participation by creative design people are key to the success of the contests. VB: It appears that one of the challenges would be protecting designers' intellectual property. How do you protect the creative designers from a company that doesn't make an award and pay for the design, but still takes the creative idea and implements it for their business? Peter van Grinsven: The design community is very active in finding out if this happens, and they will react immediately. If someone copies from our web site the community will react to this, advise us, and our support people will take action against such abusers because we want only sportsmanship on our website. It should be a fair competition. We're very tough on people that copy. Of course it could happen that a design is stolen from the website; we're not the police. But we try to keep the competitions on Choosa as clean as possible. Also, creative designers may, if they wish, put a watermark in every design they download for contests. VB: And your recommended prices for designs is not high so it is likely that most people would not be motivated to steal the creative works. Peter van Grinsven: Getting a logo is very personal. It's your logo and you get attached to it. Just taking a logo without compensating the designer for this work is a bit of a sad activity. This is likely only done by unsuccessful people. VB: Do the creative briefs posted on Choosa include information about how the Contest Holders will evaluate submissions and choose what they consider to be the best design? Peter van Grinsven: Not precisely. The creative brief describes what the Contest Holder wishes for the design. The process for evaluation of designs is an ongoing system. As designs are downloaded to the Choosa website the Contest Holder rates them using a star system of 1 to 5. Creative designers may also ask them question through the website. WE see a lot of participation by the Contest Holders and in this way designers learn what they are looking for and how the final evaluation of entries will be done. VB: Are creative designers permitted to see the proposed designs of all other designers as they are submitted? Peter van Grinsven: Yes. There are two things to say about this. One of the functionalities for the website that we might want to implement is giving Contest Holders the option of making a design competition a blind contest. In this case creative designers would not be able to see the entries from other designers. Only the Contest Holder would be permitted to see all designs as they are submitted. But one of the drawbacks is it would take a bit of the fun out of it. What happens a lot is that other designers, by reading the comments by the Contest Holder about designs as they are submitted, are able to understand much better what the Contest Holder really wants. Often the brief doesn't describe it well enough or the Contest Holder's expectations and requirements may change somewhat as specific designs are submitted. After the first design comes in and the Contest Holder reacts, all creative designers get a better understanding of what the client really wants. If you close that iterative process off you will miss a little bit of the crowd sourcing effect. Seeing an ever-growing number of designs as they come in provides an indication of what everybody collectively thinks the client wants. VB: Can creative designers submit more than one design, or modify their designs up to the closing time for each competition? Peter van Grinsven: Yes. Designers can submit up to 10 designs for each contest. VB: This must add to the liveliness of the competitions, and to the fun. Peter van Grinsven: Yes. Designers are very competitive and this is a way to see how they measure up compared to their peers – how good they are. Notwithstanding their competitive nature, they extensively congratulate the person who wins a design competition. VB: Your website indicates that you provide project owners with access to over 16,200 of Latin America's top designers. Do you regularly communicate with the creative design community? Peter van Grinsven: Yes. The most important way is we have a weekly newsletter that we send to all our designers. We also have a community section where we publish articles on great examples of creativity that can be found around the world. We want to communicate even more with the designers in the future. There's a lot of communication between our support people and the designers on a day-to-day basis on everything that happens on the platform. The designers are very much involved in everything. VB: Do you have repeat clients as Contest Holders? Peter van Grinsven: Yes. For example, there are some companies that are small web development shops and they frequently outsource their logo design work to Choosa. VB: They run design competitions on the Choosa website? Peter van Grinsven: Yes, and this enables them to offer their client 8 or 10 of the best designs that are submitted. Most of their clients are really happy with the result, they show the originals to their friends, and they talk about how the system worked for them. Word of mouth is an important engine for expanding Choosa's business. VB: Do you experience any reluctance by designers to create and submit a design in the hope their design will be chosen from among the many that have been submitted by other designers? Peter van Grinsven: Some designers think that people should not work on contingency at all, but we don't force anybody to participate in Choosa's design contests. If they like it, see the fun of it, and find there is value for them they participate. Value can be a number of things. They may earn money by winning competitions. They may gain status as a great designer. Also, they may make contacts with companies that will lead to future design contracts directly with these companies. VB: Would you say contingency work is increasingly becoming a way of providing services on the Internet? Peter van Grinsven: Yes, I think so. It's about lead generation. It's filling up your down time. You could watch television or you can make a few designs and see how you compare with other designers. If you win and understand the culture, you will understand the client. The people currently on the Choosa platform see these benefits and the other people do not want to accept how technology moves forward. If you have a direct line to obtaining graphic design work from a company it's preferable for any designer. But getting these leads is not easy, it requires time, and it's often expensive. VB: Good business leads can be hard to obtain. Peter van Grinsven: Right. Choosa is a good way for independent designers because we do a lot of marketing to obtain design business. We're spending thousands of Euro's every month to do marketing for the Choosa platform, and in this way we are doing marketing for all the designers that are interested in entering the competitions. Few designers could spend thousands of Euro's to do marketing for themselves, and that's a big benefit we provide them. VB: What has been the feedback from Contest Holders who use Choosa's design service? Peter van Grinsven: In general it's been very good. We receive many word of mouth references from companies that have used Choosa's platform. Another indicator is the low proportion of Contest Holders who ask for a refund because they didn't obtain a satisfactory design – it's below 2 percent. As I said earlier success in obtaining a great design depends on the participation of the Contest Holder. Contest Holders who are not participating in the design process are not as likely to be happy with the designs that are submitted. VB: What do you mean by the participation of the Contest Holders? Peter van Grinsven: Commenting on designs, which are downloaded by designers, using the star system rating of 1 to 5. There is also a discussion board for every contest where the Contest Holder can communicate with the designers. For example, if the Contest Holder likes a font used in a submitted design this can be communicated to the design community so future design submissions will use this desired font. It is an iterative process. As each design entry is received the company can react to it, and then all in the design community can see this feedback and subsequently they are able to modify and improve their own design ideas. Improve, of course, is according to the eyes of the Contest Holder. VB: What has been the feedback from the creative design community? Peter van Grinsven: Most of our graphic designers come to the website daily to see what articles we have posted, what contests are new and to decide whether or not to participate in it, to see the comments of Contest Holders about designs that have been submitted, or to comment to one of their design friends on the platform. So the feedback has been great. They are clearly happy with it. Of course, as you said, there is a part of the community of creative designers in the world who haven't warmed up to this new way of working. I say to designers, you can make the decision for yourself. If it doesn't work for you, don't do it. VB: Has the number of design projects posted on Choosa been steadily increasing over the past few years? Peter van Grinsven: Yes, we've been growing over the last two years. We have almost reached 900 contests. We're currently at 899 and I just saw that one came in. When we launch this one it will be the 900th. We've grown our creative designer user base from zero to 16,258. We have paid out almost US$ 200,000 to designers who have won contests. We're still working on this platform, and we have many great plans. VB: What are some of your plans for enhancing Choosa? Peter van Grinsven: We are continuously improving the functionality of the website. For example, we recently improved the details of the briefs – the forms which a Contest Holder needs to fill in for a design project. We improved the platform through which the designers can communicate with each other. There have also been many marketing-related enhancements such as an affiliate program. More changes will be implemented on the site in the future. These changes will focus on improving the usability and transparency of the website. We are presently focusing on marketing and programming activities, and on expanding our team dedicated to running Choosa. VB: Do you still consider Connaxis and Choosa to be 'new ventures? Peter van Grinsven: Connaxis has operated for 4 years so it is starting to be a proven company as it has passed the three-year threshold. Many companies fail in the first 3 years. Even so, I still consider us to be a new venture. And by introducing products such as Choosa we keep on confirming that we are entrepreneurial. Connaxis was founded in 2000 but for the first seven years I sold my services as a consultant to other companies. In 2007 we started hiring people and making it into a full-fledged company. VB: Is your business focus primarily South America? Peter van Grinsven: We have clients worldwide for both Connaxis and Choosa. In 2007 we started by selling our services to the Netherlands, U.K., U.S., and Canada. We've been changing our focus little by little to South America. One of our main focus areas is Argentina and next year it will be Brazil. This continent is growing very strongly and there's certainly no crisis here. The South American Economies are growing at 4-5% a year, on average. VB: Is Argentina is a good country for a start-up business? Peter van Grinsven: Yes. When you start a business in the Netherlands or the U.S. the cost of staff is so high that it's almost prohibitive. When I started hiring employees here in 2007 I could take more risks with my money because the people are not so expensive. VB: What is your view of the role of innovation in being successful as a company? Peter van Grinsven: I've always looked for a field where I can be successful, and that's normally a field where there's a lot of change going on. When I was in university the Internet was in its formative stage, and I saw it as offering a huge new possibility. It was a huge field, which is still opening up. If you want to be an entrepreneur you need to do something where you still can make a difference. You need to look for niches you can dive into that will enable you to make a name for yourself. So I chose the Internet. It's a big field. It's very new, and it's still developing. There's hyper competition going on in the Internet. Location does not exist anymore. It's fascinating. VB: What do you most enjoy about being the managing director of Connaxis and Choosa? Peter van Grinsven: It is so challenging, and that keeps me awake and alert. I enjoy daily challenges. It requires the most out of me. I enjoy living, and this is living to the maximum. VB: What advice do you have for those who would like to start up a company that is based on an Internet business opportunity? Peter van Grinsven: It's not an easy thing to do. In fact it's extremely difficult so I would advise everybody to be well prepared, work in companies, work in multi-disciplinary teams, and test their skills before they take the plunge. I took my time in becoming an entrepreneur. I did a lot of things and only started Connaxis as an ongoing company in 2007. I initially started helping out 17 new companies, and only when I was 34 did I go to Argentina where I could set up a support centre for another entrepreneur. And I learned a lot from this entrepreneur. VB: Is there anything we haven't talked about? Peter van Grinsven: One thing I would like to say to IdeaConnection's readers in regards to Choosa. Some may think Choosa is pitching designers against each other through the competitions, but it's the complete opposite. Choosa is a platform where designers can shine, where actual clients rate their works, and where they can show their profile and design portfolio. We want to make stars of the designers we have on our platform. If we build a big platform it will of benefit to all of these creative designers. I would also say that small to medium sized business use Choosa because it's the best way to get access to a large number of pre-qualified designers who are pre-qualified by people just like themselves. This means they can receive unlimited design iterations and excellent results. I would advise anybody to put in a few hundred dollars to get a well-designed logo and stationery. There's no better online deal. In the crowd-sourcing marketplace Choosa stands out for its quality. The Choosa design crowdsourcing website is well thought out. 1.1. This is a peaceful community! Choosa is a large, global community with lots of different people. As in any well functioning community, we'll never agree on everything; so just keep in mind: when you disagree, be polite and respectful. Remember, this is a peaceful community. Your participation should be focused on creating the best design! Respect other people's intellectual property. Every creative soldier works hard to create original ideas and designs. Choosa is serious about protecting copyrights and intellectual property rights. Do not post or use content that is not your own. 1.3. Choose your words carefully! At Choosa, you're on a global community platform, and the text and images you post to the site stay online for everyone to see. So before you post something, make sure you are comfortable with the way it presents you to the community. After receiving his Masters Degree in International Management at Maastricht University in The Netherlands, Peter van Grinsven went on to work for PricewaterhouseCoopers, specializing in Internet business consultancy. The Internet has been his passion ever since. He wants to play an active part in the improvements that the Internet brings and make a genuine contribution. Over the past 15 years Peter van Grinsven has built up a strong background in Internet business success and outsourcing. He is the owner and managing director of Connaxis, which makes and manages web applications, and of Choosa, a crowdsourcing platform for graphic design. He lives in Buenos Aires, Argentina. Good interview with Peter van Grinsven founder of Connaxis and Choosa . Very thought provoking. I liked it. "When I started hiring employees here in 2007 I could take more risks with my money because the people are not so expensive...."
A good question would be how many people have left Connaxis?